Made with A2 Cow's Milk. A full bodied Cheddar with a complex flavor. Smooth and buttery up front but with the classic Cheddar bite on the finish, all with a tangy aroma that comes from the creamy milk of our 100% grass fed Jersey cows. Great melted or accompanied by figs and green grapes on your next cheese plate. Ingredients: Made with raw organic cow's milk from grass fed cows, salt, rennet and cheese culture. 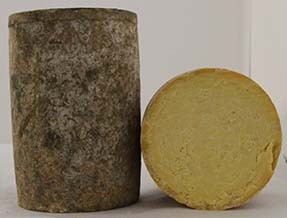 Our partners at Alpine Heritage Creamery are farmstead cheese making professionals using old world techniques and recipes. Your cheese is hand picked and shipped right from their cheese cave to your door. To ensure the quality of the cheese during delivery, all shipments will go out Monday through Wednesday with 1-2 day delivery. *We provide free shipping to the following states with a minimum purchase of $100 of Alpine Heritage products (AL, CT, DE, FL, GA, IL, IN, KY, MA, MD, ME, MI, NC, NH, NJ, NY, OH, PA, RI, SC, TN, VA, VT, WV). If shipping to a different state, you can choose either 2 day air or overnight - shipping charges will be automatically calculated upon checkout. Free shipping is supplier specific and cannot be combined with other suppliers. If you have any questions please email wholesale@revittle.com or call us directly 717.461.7447. Our name was chosen in honor of our forefathers of 12-20 generations ago who were farmers and artisan cheesemakers in the Bernese Oberland region of the Swiss Alps. Cheese lovers today still appreciate and enjoy the flavorful, good quality cheeses produced by the skilled artisan cheesemakers of the Alps. Their knowledge in agriculture and primitive farmstead cheese making practices gives them a cutting edge. This heritage is handed down from generation to generation for hundreds of years. Thus in late 2012 when we launched our creamery we chose to pay tribute to these humble farmers and progressive cheesemakers with our name. Hence, the name is born "Alpine Heritage Creamery". Here at Alpine Heritage Creamery we make hand-crafted artisanal cheese using only raw organic milk from 100% grass fed cows. The milk is regularly tested for bacteria to insure that it is of the utmost quality. The rest of the ingredients are simple - cultures, traditional rennet and salt. 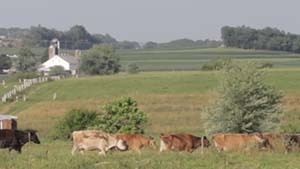 We are a second generation family run dairy farm with an onsite creamery. We produce and mature our own unique flavor and style of cheeses. This arrangement allows us to have full control of everything the cows eat, the milking process and then the making, maturing and selling of the cheese. Our cows diet consists only of organic grass, grass hay, and grass haylage. Also, a small supplement of minerals to balance their diet. They never eat grain, corn silage, or any soy products. We conscientiously remain GMO free. We refrain from the use of any form of antibiotics. We care about our cows and most likely as you read this they are happily grazing on their acres of lush green pastures at home on the farm!